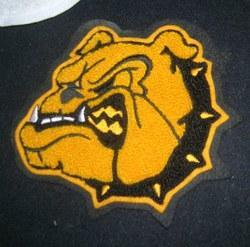 We hold expertise in offering a wide variety of Varsity Jacket Patches. Exclusively designed, these are also available for our esteemed clients in attractive designs, intricate patterns and eye-catchy colours. Our customers can buy these don-don patches from us at industry leading prices. We are leading manufacturers and suppliers of chenille patches with embroidery over it. We customize chenille patches as demanded by the customers. We can supply chenille patchse from 1-2000 in quantities. Brand Caliber Apparels Pvt. Ltd.
We are one amongst the leading Supplier and Manufacturer of Woven Patches such as Chenille Patches, M Patch, Deela back Patch, Chenille Patch and Leather Jacket Patches from Greater Noida. These patches are offered in variety of designs, colour combinations and are rich in quality. We are engaged in manufacturing and supplying an extensive range of Chenille Patches. Our entire range of these patches includes different colour combinations and a plethora of designs. Our patches are easily and conveniently applied on any kind of clothes and fabrics. We are leading manufacturers and suppliers of mascot patches as per the demand of the buyers at competitive price.